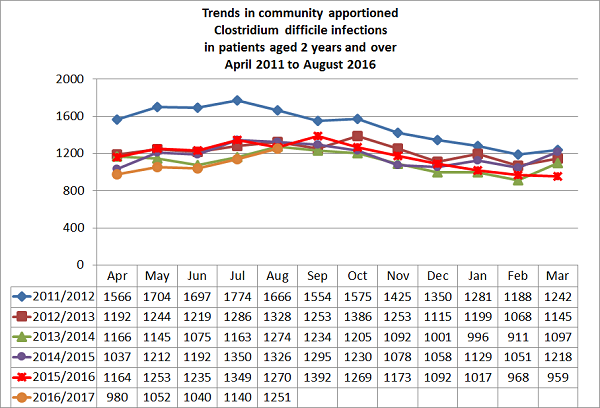 This information is written for patients, carers or anyone who is interested in trends in MRSA bloodstream infections or Clostridium difficile. It also aims to provide an overview of the impact of the new requirement from April 2013 to carry out a Post Infection Review following the contraction of an MRSA bloodstream infection whilst receiving healthcare. Monthly data is published by hospital trust and clinical commissioning group. Statistics are published using the revised Public Health England regional areas. Around 8% of Staph bloodstream infections were resistant to meticillin related antibiotics in this reporting period compared to 7% for the same period last year. There were a total of 16,242 Staph bloodstream infections recorded between November 2015 and November 2016 (5% higher for the same period last year). For the latest trends in Staph infections that do respond to these antibiotics see the numbers of MSSA bloodstream infections in the downloadable tables below. Bloodstream infections (bacteraemia) account for around 10% of all healthcare associated infections, only 4% are caused by MRSA. Other infections where MRSA may be involved are not included in these numbers. Examples of MRSA infections excluded from these figures are urinary tract infections, lower respiratory tract infections, surgical site infections (deep and superficial), skin and soft tissue or other infections. 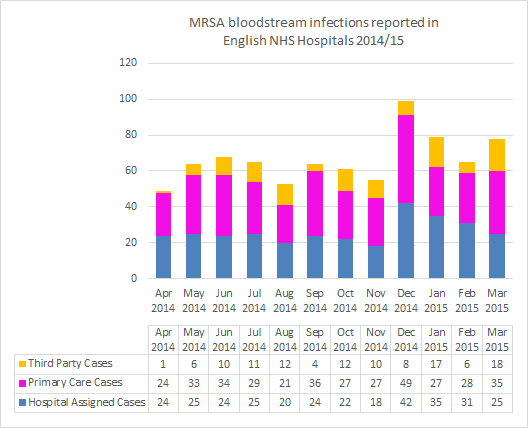 Of the 862 MRSA bloodstream infections reported in the downloadable tables below, 66% (571) were attributed as being contracted outside of the hospital setting over the last 13 months. It should be noted that cases are published based upon their assignment at the time of extraction regardless of whether Post Infection Review (PIR) status has been finalised. 31% of cases for the month of November were finalised by the time of data extraction. Changes and updates to the data after this date are reflected in future publications. 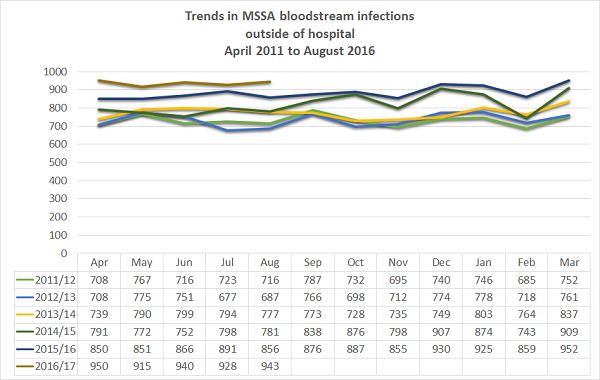 There were a total of 15,380 MSSA bloodstream infections recorded during this period, 12,014 (78%) were attributable to infections outside of hospital, an 8% increase compared to the same reporting period for last year. 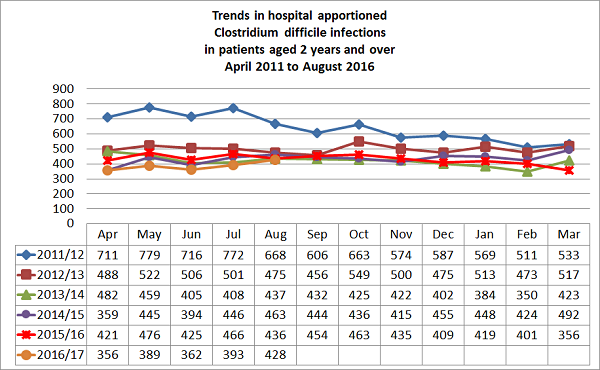 The Clostridium difficile figures indicate that nationally, of the 19,269 reported cases, 73% (14,087) were recorded as outside of the hospital setting over the last 13 months, an 11% decrease compared to the same reporting period last year. The Department of Health no longer publish weekly statistics broken down by hospital site. The last available weekly report covering the period 5 February 2012 to 24 February 2013. There is now a requirement to carry out a Post Infection Review in all cases of MRSA bloodstream infection and the purpose of the review is to identify how a case occurred and to identify actions that will prevent it reoccurring. MRSA Action UK believe this approach should be undertaken for surgical site infections, to enable benchmarking between organisations, sharing best practice. Work is ongoing with hospital Trusts with experts in infection prevention and control and theatre practitioners to identify and mitigate risk. Post Infection Review relies on strong partnership working by all organisations involved in the patient's care, to jointly identify and agree the possible causes, or factors that contributed to the patient's MRSA bloodstream infection. Guidance has been produced to aid in the identification, information exchange and reporting of cases of MRSA bloodstream infection to help Clinical Commissioning Groups (CCGs) and healthcare providers conduct post infection reviews. It is considered unacceptable for a patient to acquire an MRSA bloodstream infection while receiving care in a healthcare setting. It has set healthcare providers the challenge of demonstrating zero tolerance to MRSA bloodstream infections through a combination of good hygienic practice, appropriate use of antibiotics, improved techniques in the care and use of medical devices, and adherence to best practice guidance. Healthcare providers are expected to ensure that MRSA bloodstream infections become exceptional events, or events that could not have been prevented whilst receiving healthcare. The hospital trust hosting the laboratory that processes samples will usually undertake the data entry. The integrity of the data entry will be assessed during the post infection review. Assignment to a "third party" through an arbitration process can now be made for cases with a specimen dated after April 2014. The "third party" option provides a category for patients who have been attributed to healthcare providers giving primary or hospital care that may have been provided in another hospital or nursing home who may not have been involved in the patients care, or who can provide strong evidence following post-infection review that there were no failings in patient care. It should be noted therefore, that cases attributed to individual trusts shown in blue in the graphics below should be combined with the third party cases to consider the numbers of cases reported in the hospital setting. Latest figures show that 65% of MRSA bloodstream infections were attributable to causes outside of the hospital setting. Causes of these infections were identified during the post-infection review process, a valuable tool for learning and providing evidence to suggest that screening plays an important role in reducing risks for patients needing surgery. The graphs show an increase in the numbers of bloodstream infections caused by Staphylococcus aureus, the increase coincides with the decision to move away from universal screening. Although progress has been made since mandatory reporting of MRSA has been introduced, this bacteria shows resilience and despite best efforts trends for the last 5 years show an increase. 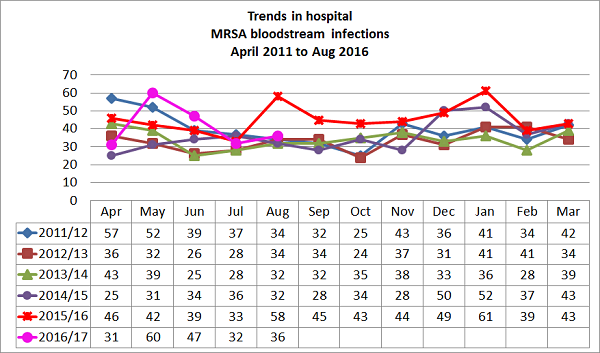 In 2011/12 there were 472 hospital reported MRSA bloodstream infections, this reduced by 16% the following year to 398, however the trend is now increasing, and 5 years on there is an overall increase of 11%, with the most significant increase seen in 2015/16, a 26% increase over the year with 541 cases being reported in hospital (299 of which were assigned to the reporting hospital Trust). The rise in numbers coincides with the Department of Health’s change in policy on screening for MRSA, from universal to targeted screening. 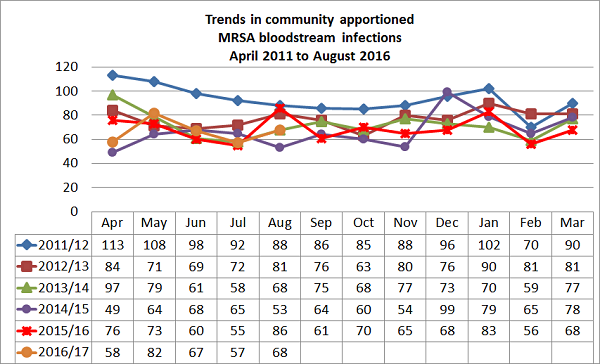 MSSA bloodstream infections are at their highest levels for 5 years, increasing by 4% over the last year, and 2% since 2011/12 with 2,910 cases reported. These infections are sensitive to Meticillin related antibiotics but still cause significant morbidity and mortality in vulnerable patients. 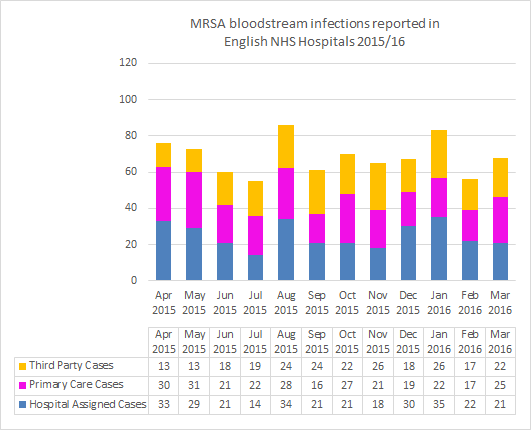 There has been a 37% drop in the numbers of MRSA bloodstream infections reported in the primary care setting over the last 5 years with 1,116 cases reported in 2011/12 down to 820 cases in 2015/16, but the trend in reductions halted in 2014/15 and a 3% increase was seen over the last year. Staphylococcus aureus is a pathogen that we live with every day and is proving to be a significant challenge in and outside of hospital. 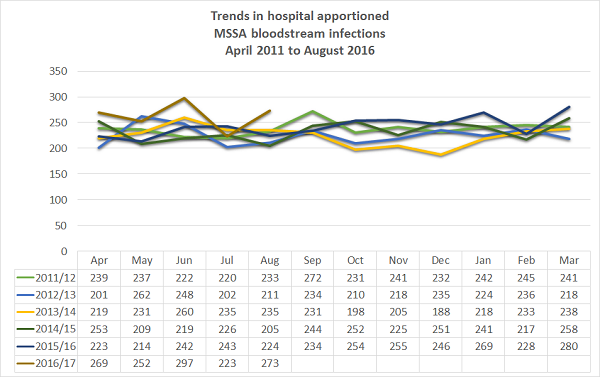 MSSA bloodstream infections have shown an increasing trend in hospitals over the last 5 years. There were 8,767 cases reported in the primary care setting rising by 18% to 10,584 in 2015/16. 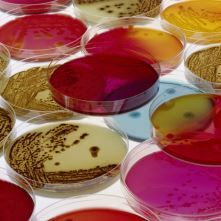 It is unclear from the surveillance what proportion were attributed to lapses in care or unrelated to healthcare, but in terms of tackling antibiotic resistance, a worrying trend if more antibiotics are needed to tackle the infections. Public Health England has made information available on mandatory reporting and antimicrobial resistance in the health profile portal, which is accessible to the public. To find out how your area is performing visit Public Health England’s Antimicrobial Resistance pages.